The great Roman gladiators of the time, although slaves, were very well treated for the most part. They were fed well and received the best medical attention money could buy. After all, they were both warriors and entertainers for the Roman people. Who wants to watch a couple weak and hungry dudes slap each other around. We wouldn't (although to be fair we're not sure we'd actually want to watch a real gladiator fight either). These powerful fighters took on not only each other in the ring but lions, tigers, even bears! I know what you're thinking, "oh my!" (You were waiting for that, weren't you?) "I could never be one of those fearsome brawlers!" Well, we're here to say that you absolutely can...look exactly like one of those battling brutes! Fight the good Halloween fight in this Roman Gladiator Costume! Wear the ancient armor of the most brutal group of fighters since the Spartans! (And yes, among other exotic peoples, Spartans fought as gladiators.) Which weapons will you choose? A net and spear (difficult to work but deadly for catching enemies by surprise), Dual swords (flashy and full of offense but hard to block javelins! ), or will you pick up the age old classic pairing of the sword and shield? 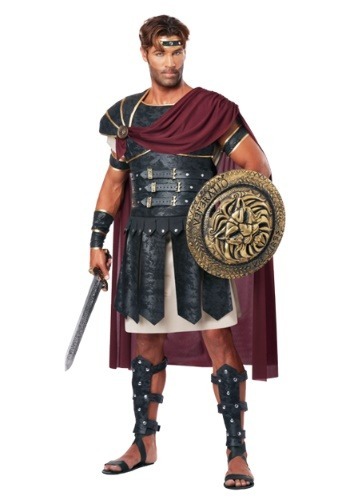 This costume comes with a pullover tunic, body armor that attaches with Velcro, faux suede armbands, a matching headband, foam shin guards, as well as a molded plastic medallion. Add Roman sandals to complete the look and let the crowd go wild with the entertainment you provide! We'd recommend just looking really good in this armor instead of actually fighting since it's not quite as sturdy as what the real deal was! But hey, maybe looks will win the crowd, it's happened before!